Description: This was the first land battle in Virginia. Maj. Gen. Benjamin F. Butler sent converging columns from Hampton and Newport News against advanced Confederate outposts at Little and Big Bethel. 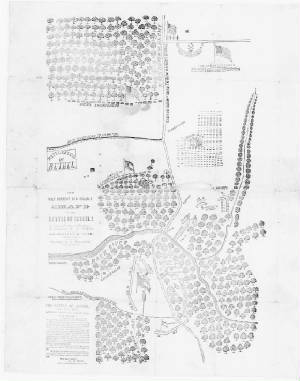 (Also see the Bethel Battlefield Map below.) Confederates abandoned Little Bethel and fell back to their entrenchments behind Brick Kiln Creek, near Big Bethel Church. The Federals, under immediate command of Brig. Gen. Ebenezer Pierce, pursued, attacked frontally along the road, and were repulsed. Crossing downstream, the 5th New York Zouaves attempted to turn the Confederate left flank, but were repulsed. Unit commander Col. T. Wynthrop was killed. The Union forces were disorganized and retired, returning to Hampton and Newport News. The Confederates suffered 1 killed, 7 wounded. Bethel also witnessed the First Confederate Soldier Killed in the American Civil War. Approximately 125,000 North Carolina soldiers fought during the course of the war; moreover, 40,000 never returned home. 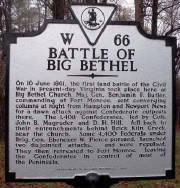 At the Battle of Big Bethel, the Old North State had experienced its Baptism of Fire and witnessed its first casualty. Sources: National Park Service; Official Records of the Union and Confederate Armies; Library of Congress. 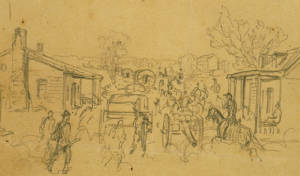 Civil War Battle of Bethel Church, by D. H. Hill, Jr. Remarkably, little has been published about such organizations in the past, so Fred Ray's book offers a unique study of the evolution of Civil War infantry tactics, revealing a more complex, sophisticated approach to the battlefield than is usually understood.